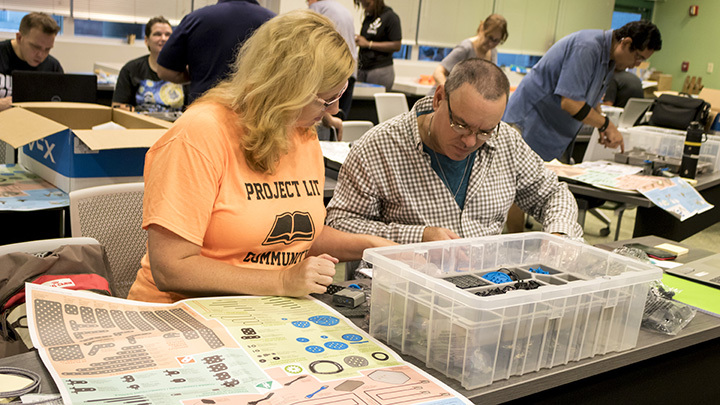 More than 40 educators from across the U.S. are participating in a week-long training to learn how they can implement robotics curriculum in their schools. TAMPA, Fla. (July 23, 2018) – To help grow the number of robotics programs offered in K-12 education, the University of South Florida’s (USF) College of Education is hosting a free-of-charge training session to provide teachers with the tools they need to implement robotics curriculum in their schools. More than 40 educators from across the U.S. are participating in the week-long training from July 23-26 at the USF Tampa campus. The training is hosted by the USF College of Education and the David C. Anchin Center for the Advancement of Teaching. Training sessions are focused on giving teachers science, technology, engineering and mathematics (STEM) oriented training in robotics that they can integrate into their classrooms. Hands-on activities such as robotics can inspire students to develop an interest in careers in STEM and build skills in coding, programming, problem-solving, teamwork and communication. At the end of the camp, participants will be eligible for REC Foundation industry certifications in the subjects of pre-engineering or robotics. Teachers participating in the training will gain hands-on experience with robotics equipment provided through a $50,000 gift by VEX robotics, a provider of educational and competitive robotics products to schools, universities and robotics teams around the world. For more information about the training session, please contact Elizabeth Engasser at (813) 974-8723 or by email at eengasser@usf.edu. Home to more than 2,200 students and 130 faculty members, the University of South Florida College of Education values high-quality education and excellence in research, teaching and learning. Through innovative research opportunities, hands-on field experiences and community partnerships, the College of Education provides the resources students need to become world-class educators, researchers and leaders. The USF College of Education is accredited by the Council for Accreditation of Educator Preparation (CAEP) and is fully approved by the Florida Department of Education.